Run out of wrapping paper or just looking to get creative? Turn a rubber eraser into a Christmas shape (don't be intimidated—it's fairly simple to carve!) and use it to stamp a pattern on kraft paper. 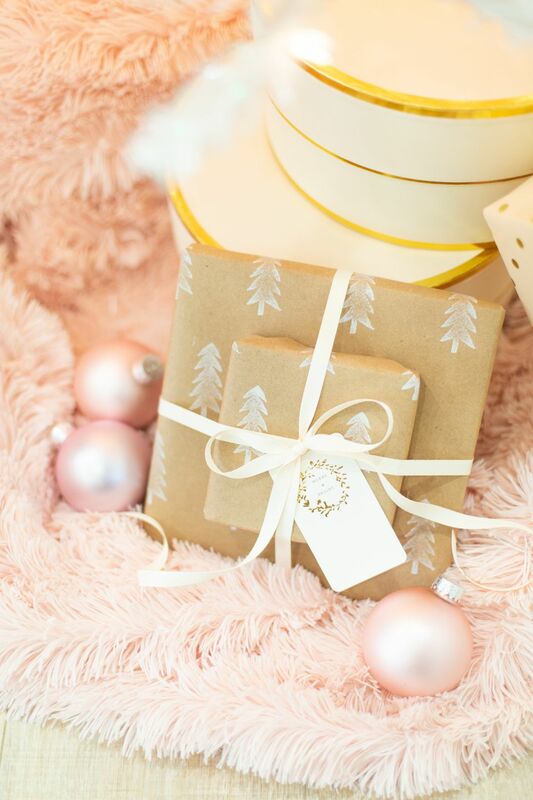 The result is pretty customized wrapping paper to add an extra-special touch to all of your gifts this year! With Christmas quickly approaching it is time to start wrapping all the wonderful gifts you have bought for your family and friends using beautiful wrapping paper. One thing is for sure after buying all those Christmas gifts you might be feeling tight for cash so one way to help save money over the holiday season is to make your own wrapping paper, gift toppers and gift tags to wrap all your gifts. This printable black and white Christmas tree wrapping paper has a modern design that is perfect for all of you who only have a black and white printer at home and not a color version as you can still print beautiful wrapping paper for the holidays. Do you always find your kids or teenagers always on their phone texting their friends? If so you can wrap their Christmas gifts with some playful emoji gift wrap that you can make by adding facial details out of paper and sticking it onto yellow gift wrap. Making your own decorative wrapping paper is super simple, just grab a roll of kraft paper and write a holiday message across the entire sheet of paper using a black Sharpie marker. Remind someone this Christmas of a cherished memory by printing a photo of them and using it as the gift tag for their present. The beloved memory shown in the photo might just make the person smile more than the gift itself. Using paint, either paint brush strokes or splatter paint onto kraft paper to make your own unique gift wrap which is perfect for wrapping all your holiday gifts. Make your wrapped Christmas gifts look extra glam this year by using a gold ribbon and tying on your own handmade gold foil Christmas tags by printing the free template and applying reactive foil to the printed designs with a Minc Foil Applicator or laminator. Use up the extra bit of tinsel from decorating the tree or garlands hung throughout your house by using them instead of bows to beautifully top wrapped presents this holidays season. Skip the traditional Christmas wrap and use this super fun tropical themed gift wrap complete with palm trees that you can print and use for all your presents. Use your Silhouette cutting machine to cut these custom Christmas tree gift boxes out of cardstock paper to wrap all your small gifts this year. Make sure you can easily keep track who each of the wrapped gifts will go to by printing these sweet angel gift tags that you can write each of the gift recipients names onto before you stick the tag to the top of the gift. For an eye-catching wrapped present, this DIY project is perfect. Use paper to create your own Christmas lights garland that can be wrapped around a present to give it a beautiful finish. The end result is almost too pretty to rip open. Cut out mini paper stockings and hang them across a wrapped present for a creative way to decorate a Christmas gift. Print custom monogrammed holiday gift tags to help everyone in your family easily identify all their Christmas gifts under the tree this year with this quick DIY project. Stick on one of these simple DIY black and white gift tags on the center of your wrapped Christmas gift to instantly make any regular wrapping paper suddenly seem more festive. Add some black and gold details to your Christmas gifts with your own handmade gift tags that you can make by printing out the tags and cutting them out. Skip running to the store to buy more wrapping paper the next time you run out of paper, and make your own sheets of festive gift wrap by printing your own patterned gift wrap using a free template. Tie on these classic gold Christmas wreath gift tags that say peace, love, joy and have a handy line to write your name and the name of the gift recipient to your Christmas gifts this year. Hang some printable Christmas ornament gift tags on each of your presents this year after you wrap them so you can easily tell on Christmas who each gift belongs to. The printable design is available in a variety of colors such as pink, blue, orange and green and also has several messages including happy holidays, merry and bright, and jingle jingle. If you are searching for some classic Christmas gift tags to use on all your presents this year, these tags are perfect and take only a few minutes to make leaving you plenty of time to enjoy the holidays with your family. Download and print this set of matching gift wrap and tags to wrap all your presents as an easy way to save money over the holidays. Use those extra ornaments that you did not hang on your Christmas tree by attaching them to a ribbon or string wrapped around a wrapped gift as a beautiful ornament gift topper that makes any gift look extra amazing. Add an elegant hand-lettered calligraphy gift tag to the top of your present with this printable design that you can either tie onto a present with ribbon or stick on with a piece of washi tape. The template comes with both the beautiful oh joy and peace, love, joy design which can be printed onto cardstock. Instead of ribbon use your roll of glitter duct tape to decorate a wrapped Christmas present. You can easily stick the tape around the center of the gift and then DIY a simple bow out of the sparkling duct tape for the top.